Well apparently in WotOG, comboed with Fandral Staghelm this card can target your hero - and thanks to that one Tavern Brawl giving the hero taunt, the code exists to permanently give your hero +5/+5 and taunt. Thank god this is Wild-only now. He wasn't talking about the bug being permanent, he was talking about your hero permanently having +5/+5 and taunt for the remainder of the game. it's worded a bit weird though. If paladin gets 3 dudes for 3 and a weapon, and hunter gets x dogs (with CHARGE), and warlock gets x imps and dmg, I don't think 5 mana for this card is asking too much. And I don't even play druid. Your wish was granted, albeit it's a Paladin card. Does this even see play in Token Druid? Like, come on. It has to be played somewhere ._. Used to have a deck that uses this Thaurissan ( not needed) next turn dark wispers then soul of the forest. Next turn savage roar or double savage roar for 15 to 30+ damage. I'm a newer player, and druid has become my main class...I got one of these through a pack and tbh thought it was junk right away. Proceeded to craft pairs of ancient of lore, war, and forces of nature....recently put this into a new LOE token deck and this might just be my favorite card. I'm dying to craft another one. Most decks only include 2 board clearing cards (and some don't have any), and wispers allows me to put up the potential for 15 burst damage that MUST be dealth with by the opposition. WIth Raven Idol, effectively I get an extra savage roar or POTWs. It get played in some Druid Decks especially in Combo with Soul of the Forest. Maybe this can work in a token druid that runs Shade, because you have the choice to make tokens or give a shade a huge buff while it's stealth. Could work I guess. You can target your own minions with Stealth. I don't understand why they've introduced so many unleash spells in this game. 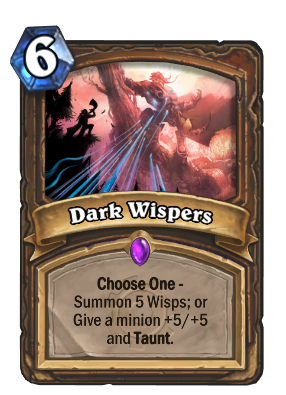 Unleash 5 wisps is actually decent for Druid, because Druid is known for having very few minions on the board. But sadly it wouldn't work with Sea Giant because it's 5 minions for 6 mana, whilst you need N minions for less than N mana to make Sea Giant effecient. In a tournament where you know your opponents' decks very well, this card might be good for a crossfire confirmation strategy, and as well has been for Firebat the Blizzcon Champion in one of the recent tournaments. Under other circumstances, this card is probably a waste of mana that instantly costs your game. Coin this on 5 mana to make your Keeper of the grove 7/9 taunt. Great for turning even your junk minions in a ramp deck into big threats like everything else. Don't worry, opponents can only carry 2 big game hunters. Guaranteed they won't have any left by the time you get to your ragnaros.